These handy 17" x 17" paper floor mats are padded at the top edge for quick tear-off. They also have a hold drilled in the upper left corner for hanging. 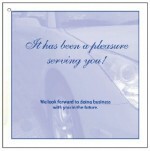 The mats are bound 100 sheets to a pad, and feature "It Has Been a Pleasure to Serve You" in blue ink.